After my previous medical mission trip to Honduras, in the summer of 2013, with my medical school (Edward Via College of Osteopathic Medicine), I was eager to head back. 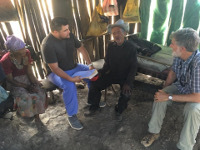 At that time, I had just finished up my 1st year of medical school and was still “wet behind the ears.” After that 10-day trip, where we provided medical care to rural village citizens surrounding Santa Rosa de Copan, I came back to the States with a sense of gratitude to those patients I interacted with. Because they honestly offered me so much more than I could possibly offer them. There was just something about all those smiles, firm handshakes, and the gratitude expressed; that planted the seed and the desire to continue the purse Global Medicine. This time around, as a 2nd year Family Medicine resident, I felt like I had more to offer to the team and the Guachipilincito and Pinaries communities. Being a 1st generation Mexican-American and fluent in Spanish, the language barrier was not an issue and I found it much easier to connect with the patients I interacted with. Similar to the previous medical mission trip, my heart felt for these patients that had very limited medical access due to the lack of “pisto” or money as the locals would say. And fortunate ones that could scrape up enough money for the travel expenses to La Esperanza (nearest city with a hospital, which is 40 minute bus ride from Pinares), for the most part could not afford the recommended medications or procedures. In the end our small group was able to provide medical care to a total of 325 patients of all ages, in the clinics and on home visits, hiking out to see patients who could not travel to us. Most of the patients seen at the clinics during this trip were aware of the medical brigades that come every 3-4 months and would make an effort to be seen, in the hopes of receiving refills or the medications they could not afford. Overall, these patients were extremely grateful to simply to be seen by a physician and were overjoyed with receiving something as little as a toothbrush, multi-vitamins, or Acetaminophen. Once again, it was a humbling experience and I was grateful for the opportunity to be able to provide medical care in these communities. It’s these types of experiences that reignite the fire within and remind me of why I chose this profession. I look forward to medical mission trips in the future. I would like to thank the other members of the brigade and the Benjamin H. Josephson, MD Fund for their support.